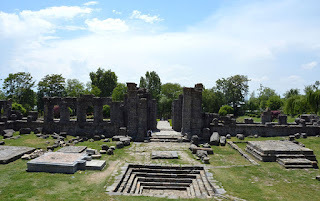 Here is Some Information about Martand Sun Temple in Anantnag Jammu Kashmir India. 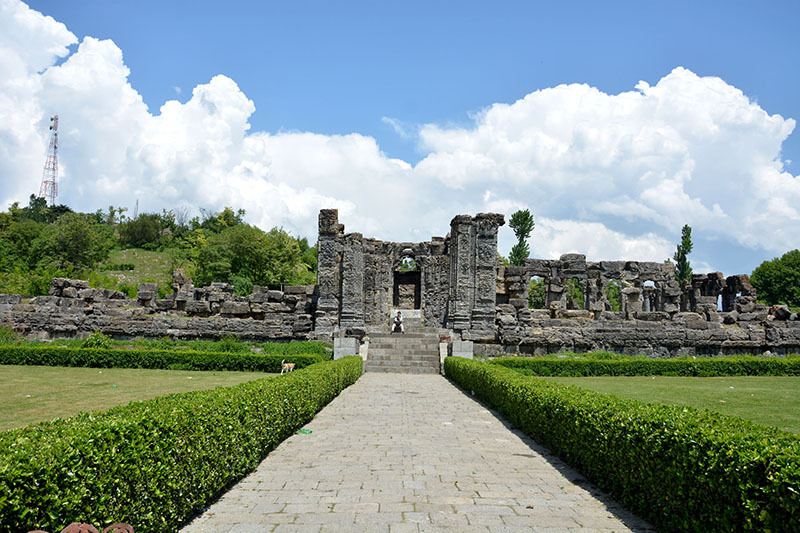 Martand sun temple is declared as a site of national importance by the archaeological survey of India. 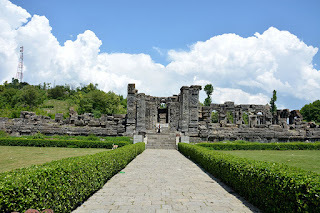 Anantnag is at a height of 5400 feet above sea level and about 33 miles from Srinagar city and easily approachable by road.Martand Sun Temple is located in Suriya Mandir Rd, Anantnag, Jammu and Kashmir India.The temple was built in around 8th century CE and built by Lalitaditya Muktapida, king of Karkota dynasty.Martand is another Sanskrit name for the Hindu Sun-god.The temple is dedicated to Lod Sun.It is a medieval temple with a courtyard, colonnaded and with the shrine in the centre. 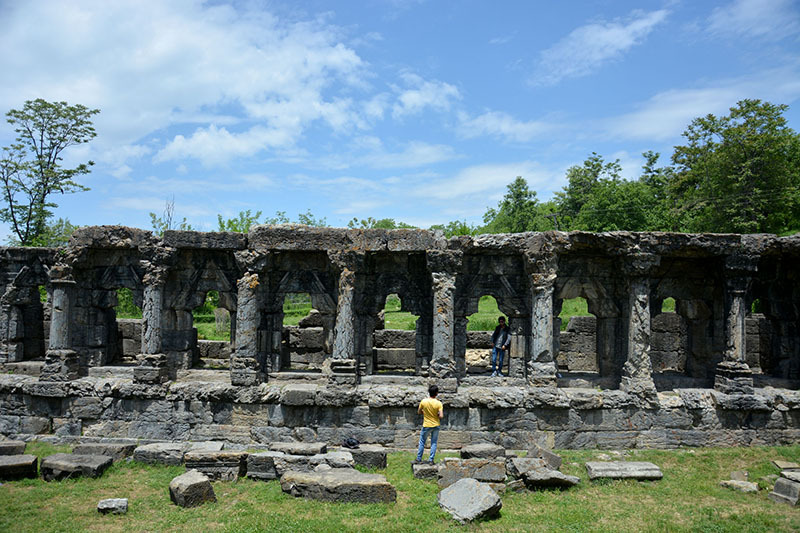 It has 84 - a sacred Hindu digit - columns and affords a commanding view of the valley.Tourists visiting the temple can enjoy a beautiful view of Kashmir valley.This temple provides a proof of the skill and talent of Hindu Kashmiris. 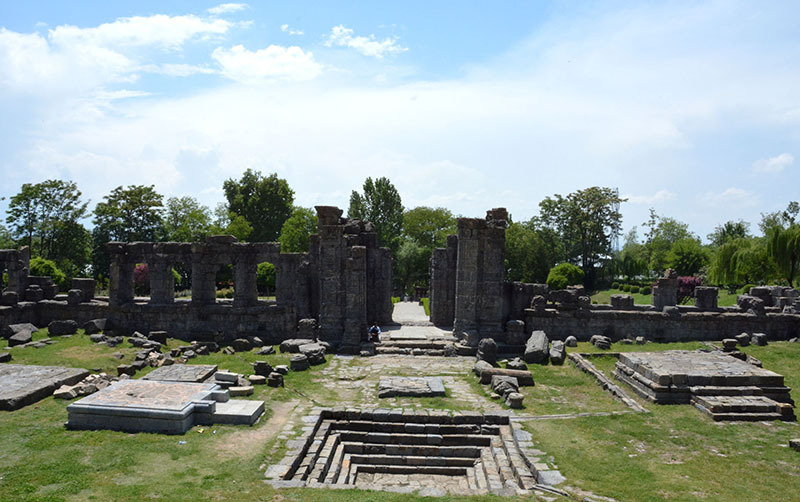 Anantnag is an ancient city that came into existence as a market town around 5000 BCE making it one of the oldest urban human settlements in the world. 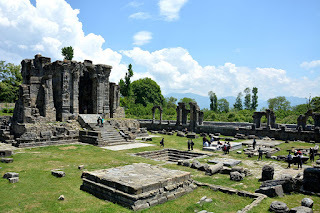 Before the advent of Muslim rule in 1320 CE, Kashmir was divided into three divisions, viz., Maraz in the south, Yamraj in the centre and Kamraj in the north of the Valley. Old chronicles reveal that the division was the culmination of the rift Marhan and Kaman, the two brothers, over the crown of their father. 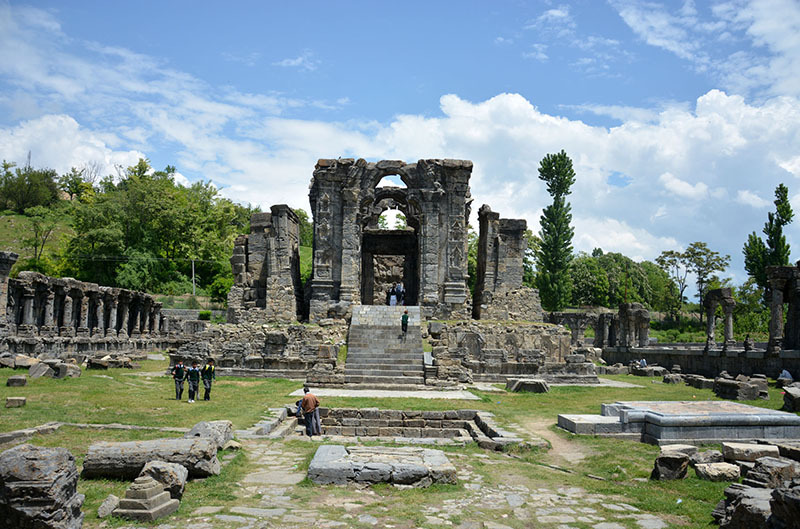 The part of the valley which lies between Pir Panjal and Srinagar, and called the Anantnag, was given to Marhan and named after him as Maraj. 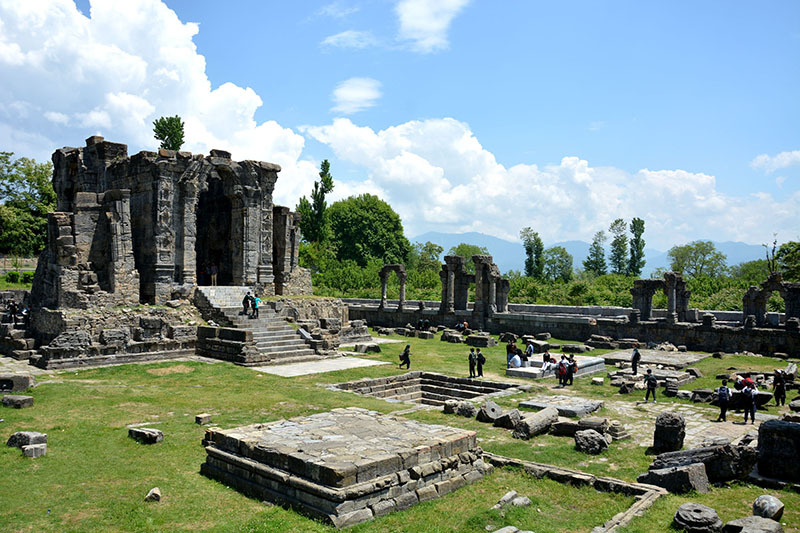 While Srinagar is no longer known as Yamraj, the area to its north and south are still called Kamraz and Maraz respectively. These divisions were later on divided into thirty four sub-divisions which after 1871 were again reduced to five Zilas or districts. According to old map of British India (1836), Anantnag was called Islamabad by some. 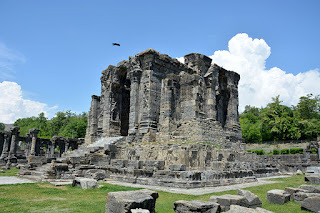 The Ancient Temple Architecture of Kashmir undoubtedly bears Greek influence. This influence is starkly visible in the use of stone Pillars , Columns , Trefoiled Doorways , Ornamental fritters , Geometrical designs especially the rectangle and Triangles , Images of Gods Carved on stones and Pediments . Kashmiri Stone Architects made some amendments to suit Intense winters . This influence is clearly visible in Martanda and Awantipora stone Temple Architecture .The majestic Sun Temple of Martand perched amidst the jungles in the plateau of Mattan in Anantnag District of Kashmir is also known as dream of stones. The temple is made of Devri stones carried possibly by elephants . Elephants were seen in abundance in Kashmir till 11th centaury which fact is substantiated in some cantos of Kalhana’s Rajatarangini. This temple is enclosed in a courtyard of columns and Arches forming covered passage all round it. .Like Chandrapida Vajraditya , illustrious king Lalitaditya was a sun worshipper and a Follower of Vaishnava cult devoted to the worship of Keshva Vishnu.. Accordingly Many three faced Vishnu and some Chaturbhuja Vishnu figures have been prominently carved on the walls of this Temple . A central Water Tank with narrow water channels are existing to this day . 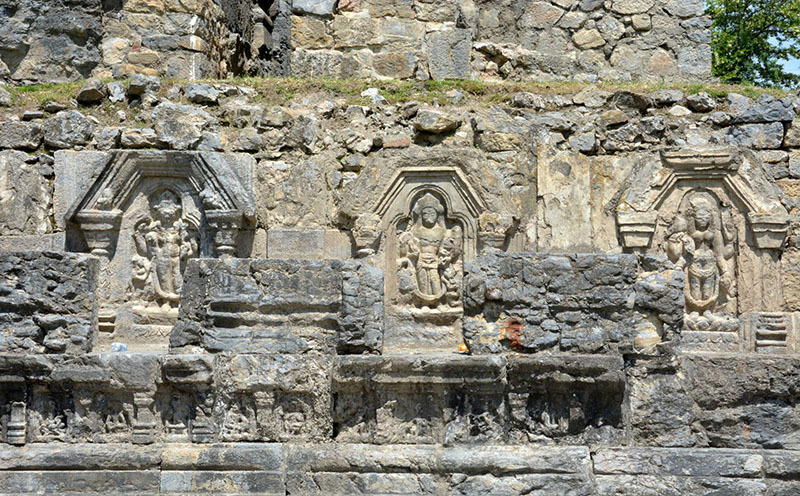 In the right panel of the eastern wall of the Ante chamber of this Temple , an image of Aruna carved discerningly is still visible . . Aruna , the charioteer of surya is holding the reins of his seven horses. The outer dimension of this temple is approximately about 200 feet by 170 feet rising upto a height of 75 feet.The inner Mandapa measures roughly 18 feet by 18 feet . About 84 stone pillars Ten to twelve feet long in single piece have been used in the construction. Some of them are still erect and the remaining are broken and scattered inside the complex. The Konark Sun Temple in Orissa. 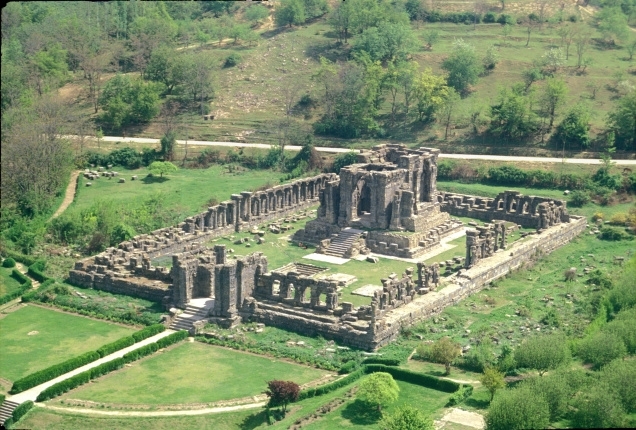 The Katarmal Sun Temple in Katarmal. 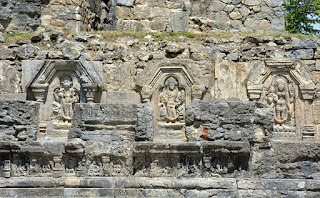 The Almora Sun Temple in Uttarakhand. 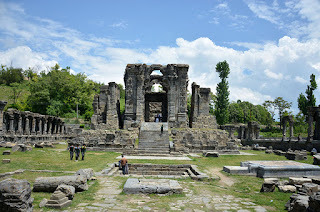 By Road : There are many public and private vehicles available to reach Martand Sun Temple in Anantnag Jammu Kasmir.Taxis can be hirged from Srinaar which takes around 2 or 3 hours. The pilgrim village is just off the road that leads to famous tourist spot of Phalgham and holy cave shrine of Shri Amarnathji. By Rail : The Nearest Railway station is Anantnag Railway station.Anantnag railway station is also connected with Kashmir Railway that runs from Baramulla to Qazigund. 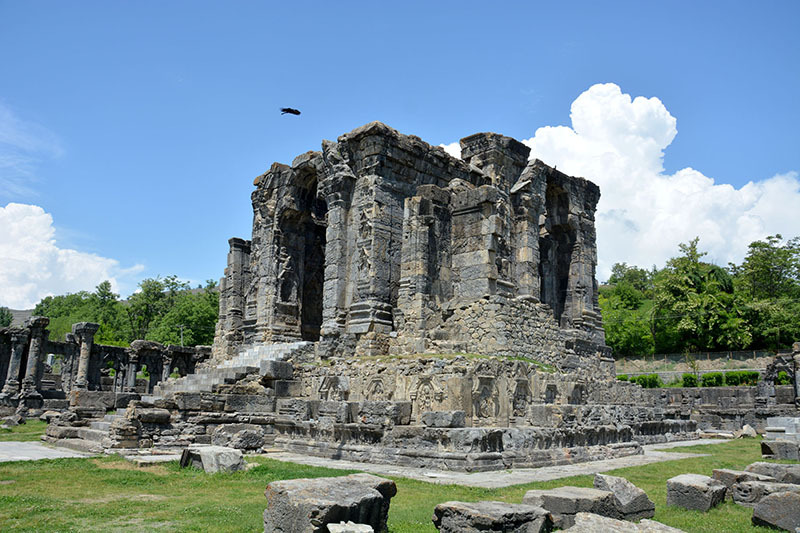 By Air : The nearest airport to Martand Sun Temple is Srinagar air force base airport, srinagar which is 11 KM away from Martand Sun Temple. Overnight Agra Tour is best tour package for visit Agra taj mahal in night, do you know Taj mahal seems so beautiful in night. book this tour to enjoy this beautiful moment.